Saybrook Point is in Old Saybrook, Connecticut. It offers a boutique hotel and inn experience on the waterfront, with a variety of differently available accommodations including longer-term vacation rentals. Saybrook Point provides three, award-winning restaurants, a full-service spa, and an on-site marina that allows guests to not only view the water but also get out and experience it firsthand. The staff is committed to going green. The hotel recycles the energy from the heated pools. Their dedication to the environment has granted them with the honor of having the first “clean” marina in the state. The accommodations at Saybrook Point are in the Main Inn, the Guesthouses, and the Lighthouse Suite. There are 102 guest rooms located in the Main Inn, which is the original inn at Saybrook Point. All the rooms were designed to be as spacious as possible, from the standard rooms to the larger, luxury suites. There are also both Junior and Full suite rooms available. The Main Inn guest rooms are the closest to the available Saybrook Point amenities as well. Standard sized 490 square foot rooms have either one king-sized bed or two queen-sized bed. Guests will also enjoy the Junior Luxury Suite, with views of the Long Island Sound. There is also a Full One Bedroom Suite at Saybrook Point, with the largest amount of space on the premises (at 790 square feet). The bedroom is separate from the dining and living areas and offers guests a king-sized bed. The suite also has a gas fireplace and a balcony that overlooks the Long Island Sound. The Guesthouses are just across the street from the Main Inn. There are two buildings - Three Stories and Tall Tales. The buildings were named with literary flair (as well as guest rooms named after historic, local figures), and provide guests with slightly more privacy. Guests will share the communal areas, which include a game room (offering billiards and chess), a common room, and multiple fire pits on the rooftop. The Three Stories guesthouse can fit up to 16 people (although this guesthouse does not allow either pets or children). There are private gardens on site as well as a relaxing wrap around porch. There are eight bedrooms, which provide either luxury, elegant and deluxe accommodations. Some of those rooms have their bathrooms with bubble tops and spray showers. The Tall Tales guesthouse can fit up to 12 people and is six bedrooms. The first floor has an open area with a living space, small kitchen, and a dining area. The second floor has the game room and the bedrooms (named after Adrien Block, Lion Gardiner, Maria Sanford, Barbara Maynard, General William Hurt, and Lady Fenwick) which feature balconies off many of the rooms. Some of the bedrooms have bathrooms as well. There is a bocce court located in the backyard as well. The Lighthouse Suite is located outside the Main Inn. It was designed to be the most private accommodation on the property, and it displays unobstructed views of the Long Island Sound. The suite is over 900 square feet and has a living room, a dining area, and a kitchenette. It is available only on a seasonal basis from May through October. The Lighthouse Suite was voted the top romantic destination on the shoreline. A final option at Saybrook Point is the more long-term vacation rentals. These rental villas have full kitchens that come fully equipped and provide flatware, dishes, and pot and pans. Trash pickup and recycling, as well as landscaping and plowing, are provided. Each vacation rental has two bedrooms, two bathrooms, a private balcony, and a fireplace. There is an additional vacation rental; the South Cove Cottage has an extra bedroom (for a total of three). All lodging at Saybrook Point features beautiful and luxurious linens and room furnishings, complimentary wireless internet access, in-room dining/room service, use of the onsite fitness center as well as the indoor and outdoor pools, and plush bathrooms for guests to use during their stay. The Fitness Center at Saybrook Point is fully equipped with a steam room, indoor and outdoor pools (always heated and available all year round), a sauna, a therapeutic whirlpool, optional fitness classes, expanded sun decks, and a large variety of state-of-the-art fitness equipment including treadmills, recumbent bikes, and free weights. A ton of different fitness classes are available for guests, from calm, morning yoga to indoor spin classes and water aerobics. 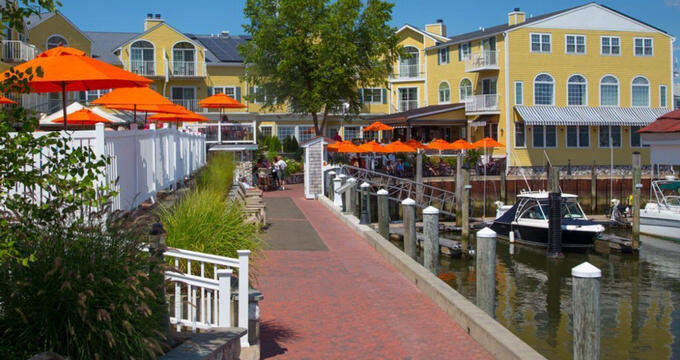 There are three different waterfront dining options for guests at Saybrook Point. Reservations for all three are strongly recommended. Fresh Salt and Fresh Salt Lounge were voted the Top Brunch spot in 2016 and continues to prepare simple, local, seasonal menus for breakfast, brunch (Sunday only), lunch, and dinner. They also serve a special lounge menu. Due to its location, the menus are often seafood heavy and feature many fresh catches from just steps outside the restaurant. For instance, there is a raw bar, and seafood and day boats. They also have a shoreline favorites menu, compiled from the dishes that have gotten the best reviews from Saybrook Point guests. Fresh Salt also features a revolving dessert menu, a full children’s menu, and a wine and spirits menu. The other option while dining at Saybrook Point is the Marina Bar. There are fire pits for cooler nights and a lookout deck just above the bar with breathtaking views of the Sound. The Marina Bar serves casual food and drinks. The chefs at all three restaurants are committed to using as much local produce and items as possible, as part of the Local Food Commitment project. Room service from the Fresh Salt locations is available. Saybrook Point features its own, onsite spa experience, Sanno Spa. The spa offers services like massage, body scrubs and wraps, facials, and manicures and pedicures. Guests can also take-home products used in their treatments, mostly from local and organic spa lines. Appointments are recommended (to expedite spa treatments. Guests can choose a spa body ritual treatment, with options like the Kate Rose wrap, Atlantic Ocean Memory, a Contouring Cellulite Gel Wrap, a Green Tea, and Lemongrass or a Lavender Mint body polish, or a Bora Bora Sand Gommage treatment. For massage therapy services, guests can choose from the Aromatherapy Swedish, Shea Butter, and Hot Stone, Breathe Easy Treatment, Swedish, Target, Deep Tissue, Muscle Release, Sacred Mother, or Detox massage. All massages are also available as couples massage experiences. Specialty therapy is available at Sanno Spa as well, and offer guests Foot Reflexology, Revive Foot Therapy, Hair and Scalp Therapy, or the Carpe Diem Duet Therapy option. The therapists at Sanno Spa also offer esthetician services, featuring Circadia and Eminence products that can also be purchased and taken home after treatment. Guests can try a Vitamin Infusion Facial, Alpha Beta Complex Peel, an Organic Arctic Berry Peel, and Peptide Facial, a Peptide Firming Facial, Gent’s and Teen Facials, mini peels, oxygen therapies, or back facials. Makeup and hair services are also available, as well as waxing. Saybrook Point guests can also explore the Saybrook Point Marina, which sits at the mouth of the Connecticut River. The marina offers world-class amenities while providing high-quality yacht services. Boats from 13 to 140 feet can be accommodated on site. It has been designated the first “Clean Marina” in the state of Connecticut. There is a full-service marina supply shop available as well.